"Botanicals are ingredients that can be marketed as goods, drugs, cosmetics, and medical devices in the United States. When a botanical is intended to diagnose, treat, prevent, mitigate, or cure a disease, it is considered to be a "drug." 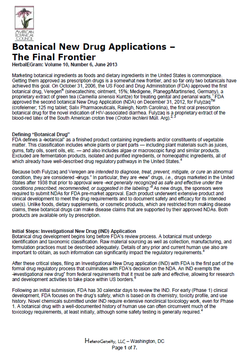 This article is reviews the US regulatory requirements for botanicals as "new" drugs." "Marketing botanical ingredients as foods and dietary ingredients in the United States is commonplace. 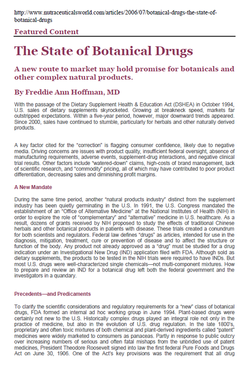 Getting them approved as prescription drugs is a somewhat new frontier, and so far only two botanicals have achieved this goal..."
The State of Botanical Drugs: A new route to market may hold promise for botanicals and other complex natural products. 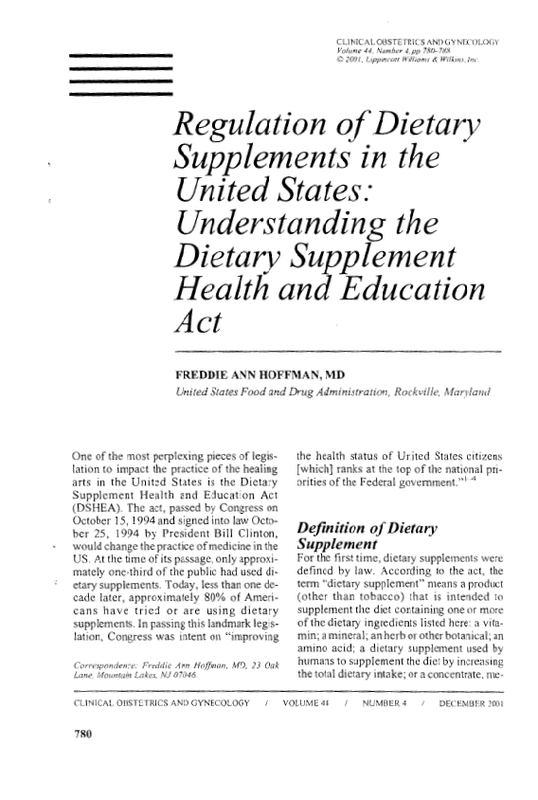 "With the passage of the Dietary Supplement Health & Education Act (DSHEA) in October 1994, U.S. sales of dietary supplements skyrocketed. Growing at breakneck speed, markets far outstripped expectations. Within a five-year period, however, major downward trends appeared. Since 2000, sales have continued to stumble, particularly for herbals and other naturally derived products." "One of the most perplexing pieces of legislation to impact the practice of the healing arts in the United States is the Dietary Supplement Health and Education Act (DSHEA). The act, passed by Congress on October 15, 1994 and signed into law October 25, 1995 by President Bill Clinton, would change the practice of medicine in the US." "Botanicals are defined as ingredients or finished products “of or relating to plants” or “a substance obtained from a plant.” Botanicals have been used by humans since the beginning of civilization. Archaeological excavation documents the medicinal use of plants by humans dating back as far as 60,000 years. Today about 80% of the world still uses plants and plant-based products to treat medical conditions." "Canada’s regulatory approach to natural ingredients, such as botanicals, probiotics, and other complex products, is somewhat unique. This ingredient class has defied global regulatory harmonization, although certain regions have commonalities in their approach. Canadian law allows such ingredients to be sold not only as foods, cosmetics, and drugs, but also in a novel category: “Natural Health Products” (NHPs)." "Probiotics have a long global history of traditional use. Although they are currently sold mostly as ingredients in foods or nutritional supplements, recent research has explored the potential of probiotics to treat or prevent disease conditions, to maintain health, and to reduce the risk of future disease​"
"Industry stakeholders for probiotics include businesses involved in conventional and specialty foods, dietary supplements, consumer health care, biopharmaceuticals, veterinary health care, and agriculture. Although the workshop was focused mainly on the use of probiotics in humans, agricultural and veterinary uses should not be overlooked​"
"In the United States, probiotics that are intended to be used to diagnose, cure, mitigate, treat, or prevent disease in humans or other animals and that affect the structure or the function of the body are considered to be drugs. 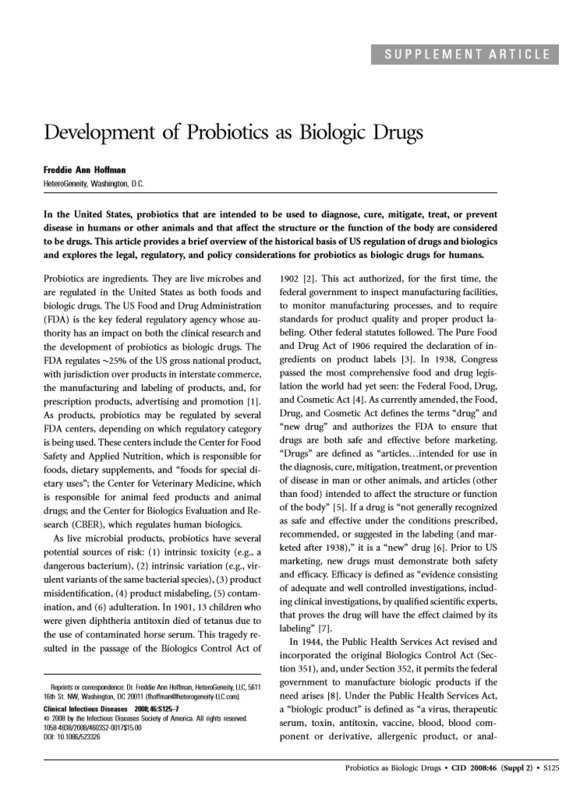 This article provides a brief overview of the historical basis of US regulation of drugs and biologics and explores the legal, regulatory, and policy considerations for probiotics as biologic drugs for humans.​"
"Although there exists some evidence of the safety and efﬁcacy of probiotics for treatment of disease, many of the clinical trials have lacked methodological quality. The regulatory route will determine the types of trial needed to determine safety and efficacy of these products. 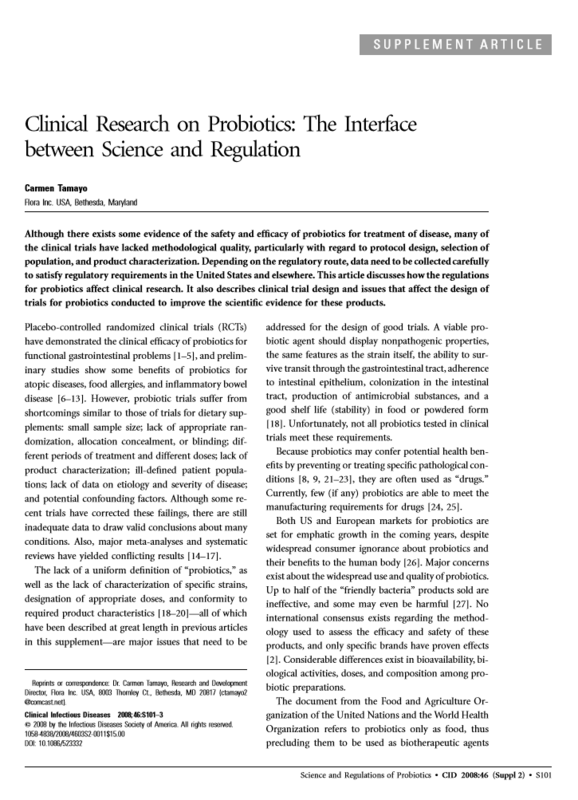 This article discusses how the regulations for probiotics affect clinical research." Copyright HeteroGeneity, LLC - 2017. All rights reserved.